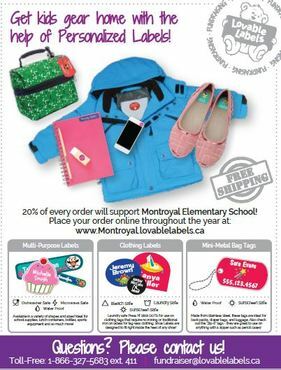 Here is your chance to meet your child's teacher, understand expectations and learn about volunteer opportunities at Montroyal. The evening begins at 6:00 for parents of Kindergarten students and our students who are English Language Learners. • Everyone else meets in the the gym by 6:15 where Mr. Campbell will welcome families, introduce staff, and discuss the state of our education system. • At 6:35 families can proceed to meet their child's teacher. Teachers will discuss their classrooms and curriculum. • At 7:05 there is a second session for those with two children in two different classes. • At 7:30 the evening draws to a close. 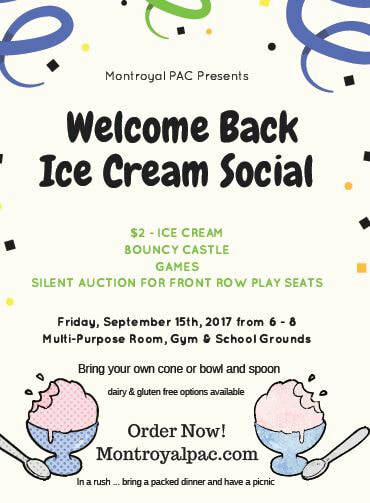 September 15 Back to School Ice Cream Social! Cost: $2.00 (2 scoops choice of Chocolate, Vanilla, Cotton Candy & Orange Sorbet). Order ice-cream tickets from Sept 8-14 at hotlunches. Please bring your own bowl & spoon OR cone! The Grade 7s will also be holding a concession stand selling drinks, cones & treats. Bring your change!​ All proceeds go towards their graduation festivities and legacy gift. When you arrive, please check in at the desk at the front door to receive your ice cream ticket(s) then move to the flavour line of choice in the multi-purpose room. Seating is available in the gym and outside in the playgrounds. We will have games, a bouncy castle and a silent auction going for front row seats to the winter and spring play! More details are provided in the printed Welcome Package that was sent home last week with students on how to register on our ordering system. TIP: Enrol in the After-School Club and BrainSTEM to take care of your after-school child care needs including enrichment. Monday to Friday, all ages! We encourage walking or cycling to school to improve students’ concentration and overall health, even a few blocks or through the forest makes a difference. If driving please review the drop zone process Getting to School Safely to ensure a steady flow of traffic. Remember you are driving through a residential area, watch your speed, particularly on Prospect, it is a 30km zone. We have received complaints from residents, drive down the street as if it where your own neighbourhood. Do you have a student in Grade 5? Children entering grade 5 for the 2017-2018 school year take on the task of Traffic Duty, now called the Move It Team. Shifts are available for before and after school to accommodate various schedules. Please see HERE under "Getting to School Safely - Move It Team " for the duties involved, sign up sheet and access to an incident feedback form. Parent Consent forms now ONLINE! Get a head start on filling out forms! Four parent consent forms are now officially available via School Cash Online. The school board kindly requests all parents/guardians to login, fill out the forms and submit before September 21, 2017. Click HERE for the School Cash Online website.